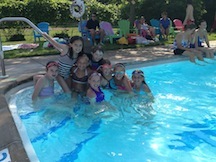 Celebrate your birthday with a party at the Clinton Community Pool! Parties are offered on Saturday mornings from 10-Noon. Enjoy full use of the pool along with the services of our certified life guards. An ice cream treat is provided for each child; families may bring additional food if they want. Picnic tables and chairs are provided. for 21-30 children, cost is $225. Please complete the Birthday Party Reservation Form. After you fill out reservation request, we will contact you to go over details and availability before the date is confirmed. Space is limited. Feel free to stop by or call the Pool for further questions.